About a week ago, I was driving through Hamilton and my stomach was growling something fierce. Unfortunately, it was Sunday night and it seemed all of the restaurants were closed. I pulled over at a gas station to grab a pop and check the Googles to see if there were any restaurants hiding somewhere that I could order carry-out from. Luckily, there was one. 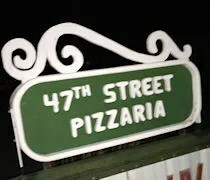 47th Street Pizzaria (sic…that’s how it’s spelled on their sign) is kind of hidden in Hamilton. As the name implies, it’s on 47th Street just north of 136th. It’s to the west of M-40 which is the main thoroughfare through town. The restaurant is in kind of a weird spot. The area to the immediate north of the building is all residential. The pizzeria shares land with ND Collision and that’s about the only commercial property in the area. Surprisingly, it didn’t take long to find a menu online. They don’t update it much but at least their Facebook page has pictures of the menu. Wraps and subs are both options and probably would have been easier to eat in the car, but on my first time at any pizza shop, I’m going to order a pizza….duh. 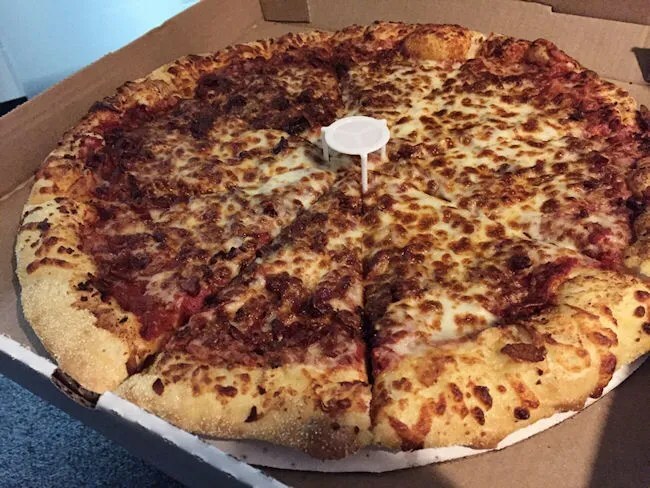 I called from the gas station I was sitting at to put in an order for a 16″ pizza with pepperoni and bacon. I was told it would be about a half hour, so I had some time to kill. As the only open restaurant in town, they seemed to be pretty busy as a steady line of cars came to pick up pizzas while I was sitting in the parking lot. Right around the twenty minute mark, I decided to head inside. There was one lady working by herself running around the kitchen trying to keep up. She asked for my name then checked on my pizza which was just about to come out of the oven. In the mean time, I paid the bill of just over $12 then took a seat at one of the two tables set up as a dining area. Almost as soon as I sat down, my pizza came out and was being cut up. I grabbed the box and headed back to the car. I still had to drive back to Grand Rapids for work, but I sat there and ate a couple of slices before getting on the road. The pizza is pretty typical take out pizza. The crust is somewhere in the middle of thin and thick, but it was cooked pretty well with some crunchy areas. The cheese was put on kind of sloppily, but that can be a good thing. Extra shreds of cheese cling to the handle part of the crust and cook up to a dark golden brown adding both flavor and crunchiness to a pretty standard crust. The meat toppings were underneath the layer of cheese and layered right in to a pretty tasty, sweet sauce. It had a lot of the characteristics of a canned, restaurant supply sauce, but it was a little sweeter than is typically found in the can. There was a pretty thick layer and once it started mixing with all the grease from the meat and cheese, it created a delicious swirl of flavors. 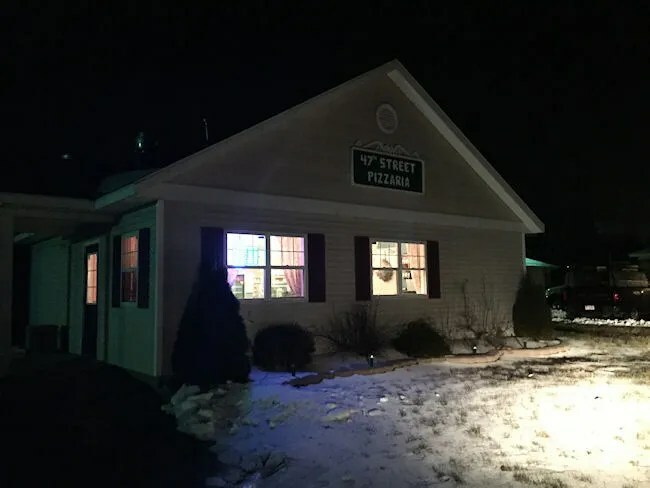 47th Street Pizzaria (typing the name that way really hurts my head) was a welcome site as I drove through rural Allegan County. 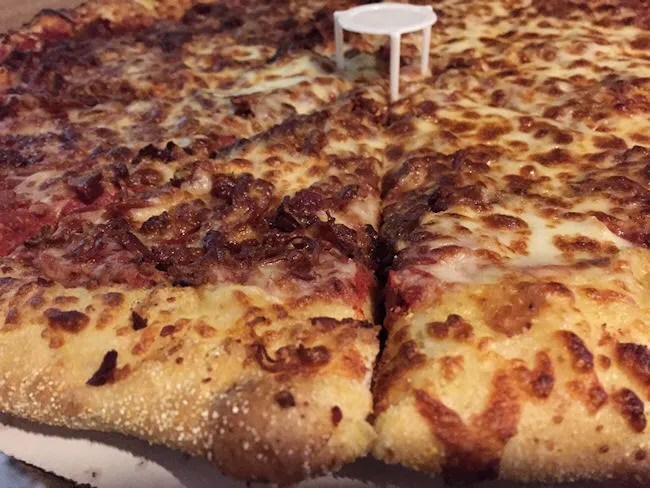 The pizza is what you look for in a hometown pizza place. The price is pretty cheap and you get a hearty, filling pizza. There’s nothing that really stands out about it other than it’s from where you are and that’s what you grow up.